Ducks Crossing is a traditional Cornish Cottage set around a charming courtyard. Guests have use of a 40ft swimming pool (shared with three other cottages). The property offers comfortable spacious accommodation with a separate dining room with French doors leading to an outdoor garden with a bar-b-cue. There is a fully fitted kitchen, and a lounge with stairs to three bedrooms. One twin,one double with en suite, one bunk bedroom and downstairs a further separate bathroom with toilet. The Eden Project is within 10km and the town of St Austell is nearby with shops, supermarkets, and a railway station and hospital. Hi-speed wifi in all properties. I live in the property and enjoy the rural and peaceful ambience of the area. I work and lecture in Complementary medicine and colleges and the property also offers a clinic for therapy and relaxation treatments. I live here as it is a very beautiful part of the country with milder and sunnier weather and also near beaches. 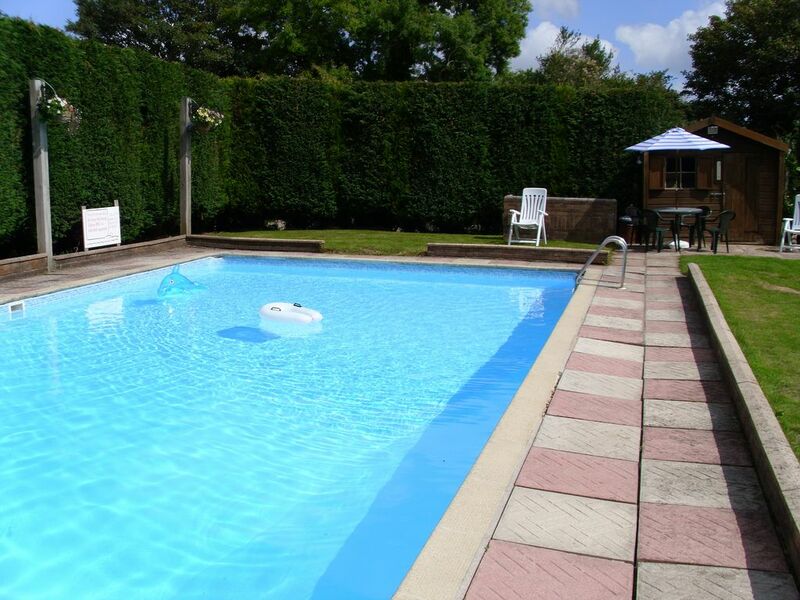 40 ft pool open from 25th May to Mid Sept.
Outside: Rural views, ample parking. Outside 40ft pool. bar-b-que. Near many beaches and central for all of Cornwall. A lovely charming cottage, perfect for families or couples wanting to get away. The moment we arrived we were greeted by the welcoming owner who made us feel straight at home. The cottage was clean and cosy offering everything you needed. The pool was a huge bonus and the children loved it. Externally on one side of the cottage is a lovely courtyard that the front door opens onto. Here you can sit outside and eat and it has a distinct Mediterranean feel. On the other side the back foot opens on to a garden that has some water features and a outside conservatory which you can relax in. I would defiantly recommend a stay here, it’s positioned well and although close to St Austell you feel as if your in the middle of no where. Thank you Clelie, pleased all went well. Lovely to have met you and your family. Hopefully see you next time. Booking Notes: Contact manager, Will Williams for availability and prices. Deposit required on booking and balance within 8 weeks of arrival. Deposit refundable up to 8 weeks before arrival. After 4 weeks balance non refundable. Changeover Day: Saturday. Arrival after 2pm and departure before 10am Saturday, to give time for cleaning and preparation of property.